Living the good life gluten-free has never been easier! From baked treats to mashed potatoes, more products than ever can be found in gluten-free varieties, and with the help of LiveGlutenFreely™, you can stay up-to-date on great gluten-free products and news! LiveGlutenFreely is an online community created by General Mills that offers gluten-free product news, articles and real-life stories from people just like you. The site also provides great-tasting recipes ranging from breakfast treats like Blueberry-Corn Muffins to delicious dishes like Favorite Chicken Nuggets to indulgent desserts like Brownie Ganache Torte with Raspberries and Carrot Cake. 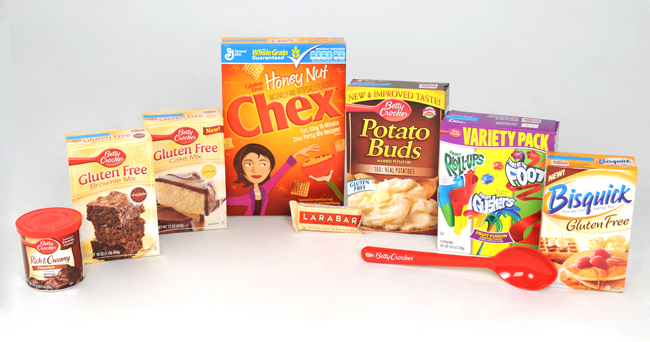 General Mills is proud to offer more than 300 affordable gluten-free products, available in grocery stores nationwide. Keep up with new additions to the gluten-free list by subscribing to the LiveGlutenFreely Newsletter. Every month, you'll receive great “goodies” like yummy gluten-free recipes, tips, coupons for gluten-free items, new product information and more delivered directly to your inbox. Click here to sign up today! Also, be sure to visit Live Gluten Freely on Facebook at Facebook.com/glutenfreely. “Like” the page and check out recipe ideas, product news and tips about living without gluten…freely! We are gluten free because my seven year old would have ended up on medication without the diet. Yes, it had that much effect on him. He's still Juju without the extremes. I know medication is not healthy and health is important. In some people, gluten has an opiate effect causing a variety of symptoms including meltdowns & hyperactivity. With so many yummy GF products, and product labeling, it's never been easier! You can purchase a Live Gluten Freely product box @ http://www.liveglutenfreely.com/ - plus it's a great source of gluten - free information! One winner will receive a Live Gluten Freely product box that includes an assortment of gluten-free products from your favorite brands like Betty Crocker, Bisquick, Chex and Larabar, a Betty Crocker Red Serving Spoon, and coupons! *Follow me @jamaise at Twitter & Tweet this : RT @jamaise #GIVEAWAY #WIN - A LiveGlutenFreely ~ Prize Pack from General Mills #myblogspark http://bit.ly/bBJkpu ends11/12 tweet each day for one entry each ! Disclaimer: LiveGlutenFreely provided me with all information and product to review through My Blog Spark. I was under no obligation to review it if I so chose. Nor was I under any obligation to write a positive review or sponsor a product giveaway in return for the free product. These views are my own. A gluten free Oreo would be nice! gluten-free croissants would be heavenly! Oh a good gluten free cinnamon roll would rock! I follow with GFC and would love some gluten free oreos too! Gluten free brownies would be nice. I'd like gluten free pretzels. Gluten free buns and pies would be very nice. gluten free donuts would be my passion! I'd like to see a really delicious, fluffy bread. I'd like to see Yeast Rolls gluten free. Liked LiveGlutenFree on FB as Judith B.
Networked Blogs follower as Judith B. Liked Gluten Free on FB as Judith B.
I would love to see a "mainstream" gluten free frozen pizza. I know that Amy's makes one but I can never find it. I think that if a more mainstream company made one that stores would be more likely to carry it. I "liked" Live Gluten Freely on Facebook. I "friended" you on Facebook. I became a friend of Wishing Penny via Google Friends Connect. Gluten Free French Bread would be awesome! I follow you on GFC.